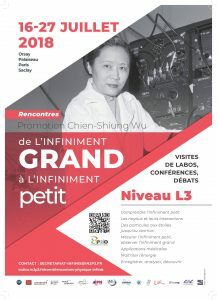 The 8th edition of “Physics Meetings, from the Infinitely Large to the Very Small” – Chien-Shiung Wu Promotion – will take place from July 16 to 27, with a day at the APC on Thursday, July 26th. Its objective is to transmit to students of physics at level L3 or equivalent, our knowledge and our experience around research topics related to the partner institutes of its organization: particle physics, nuclear physics, astrophysics, cosmology, space physics, associated instrumentation and accelerators, not to mention the applications that stem from this research (medical, accelerators, machine learning, etc.). Of course, we will talk about recent scientific news as we did after the discovery of the Higgs boson and gravitational waves. Since their creation, these “Summer Meetings of the infinitely big to the infinitely small” are held over two weeks with a well-balanced agenda. It should be noted that this agenda has also been optimized thanks to the comments and suggestions of students from previous editions. Each day includes a series of classes in the morning, where a large space is devoted to discussions with the speakers, followed in the afternoon by visits of experiments in progress in the partner laboratories. The afternoons end around round tables, debates or discussions: on the universe, job openings after a thesis, etc. 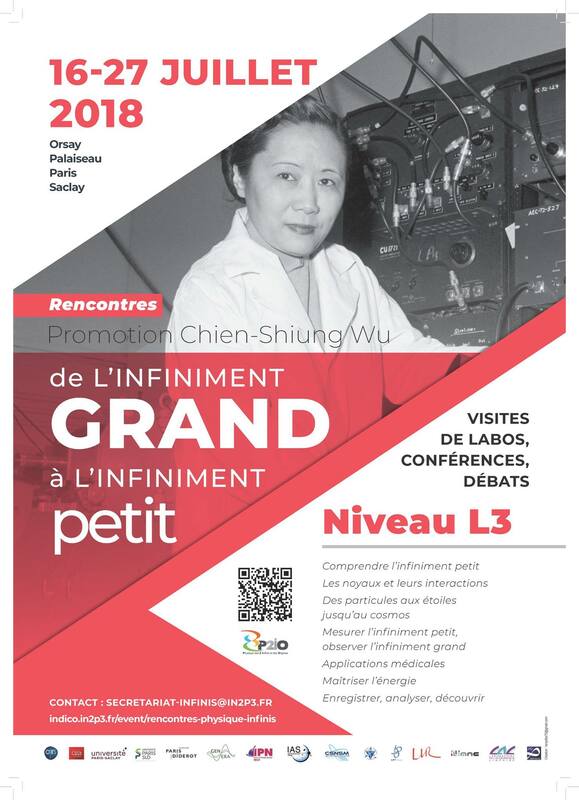 The 2018 edition is the result of a collaboration between nine laboratories in the Paris area – APC, CSNSM, IAS, IMNC, IPNO, IRFU, LAL, LLR, LPT. Most of the funding comes from LabEx-P2IO, with contributions from the Physics UFR at Paris Diderot and the GENERA project. The APC Laboratory is actively involved in the organization of these meetings, and will be pleased to welcome these students on Thursday, July 26th.